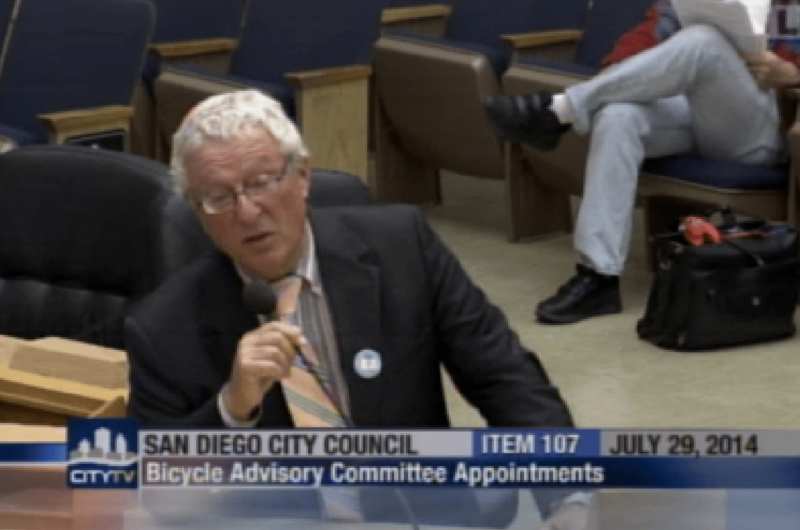 Earlier this week, on Tuesday, San Diego’s City Council unanimously approved the creation of the city’s first Bicycle Advisory Committee. This was a goal that was originally proposed in the 2002 city adopted bike plan, the city’s second plan to accommodate bicycling. City Bicycle Advisory Committee, first proposed and adopted in 2002 bike plan. Finally created in 2014. Getting this committee established was one of our goals for our second year of existence (we launched as an organization in 2012). The composition of the committee calls for each Councilmember adopting one appointee and the two appointees made by the Mayor. Districts 4, 6, and 7 do not have a representative yet, so if you live in these neighborhoods now would be a nice time to get to know your elected representatives at City Council. and myself, Samantha Ollinger, representing District 8. If you’re not sure what all the District numbers mean, here is a link to a neat map that visually shows the entire city and its council districts. At the Council session on Tuesday, the item to approve the committee was scheduled to be on the consent agenda (essentially voted on without any discussion), however frequent Council Chambers visitor and occasional mayoral candidate, Steven Greenwald, asked for the item to taken out of consent and open for discussion. He was the only member of the public who spoke about the item and he spoke in support of it. He voiced support for “designated bike lanes” and asked that the city look to Vancouver for inspiration. He also talked up bike trains, which Nicole Burgess has been leading in Ocean Beach, and Veronica and Sandra have been leading in Mid-City. Greenwald also mentioned that not all drivers were “sensitive to the fact that bicycles have a place in transportation”. All councilmembers provided positive comments. Marti Emerald (District 9) stated that perhaps even she could one day be on a bicycle, but that she was “petrified” to ride in traffic today. Mark Kersey (District 5) thanked Kathy Keehan for her willingness to serve. Sherri Lightner (District 1) thanked Petr Krysl for his willingness to serve. Lorie Zapf (District 6 and soon to be District 2) thanked the entire group of committee members and recalled her experience of riding with Burgess and spoke about the needed changes to accommodate the upcoming bike share program as well and changes at Nimitz Boulevard and where the I-8 meets the dog park. David Alvarez (District 8) spoke about the Climate Action Plan and commended the current District 2 staff that ride to their jobs at City Hall. Ed Harris (interim Councilmember in District 2) seemed a bit surprised that the issue of bicycling had made a dent at City Hall and made generally positive comments as well. Scott Sherman (District 7) spoke about the positive effects of seeing more people on bicycles. Todd Gloria (District 3) stated that this was simply a formalization of the work that all of us had done to date. He also mentioned that the work done in the city to date were “modest” but wanted to see work sped up. Gloria also mentioned that the bike share program was scheduled to launch on October 30th this year. Gloria emphasized that this committee would be working with city staff to advise them on the work that needed to be done. Emerald made a motion to approve the creation of the Bicycle Advisory Committee and newly re-elected Councilmember of District 2 (to be seated in November) Lorie Zapf seconded the motion. Thanks for the good news. How do we contact our district representatives on the Bike Advisory Committee to request bike-related improvements? Mike, Thank you for the comment. Right now the process for providing input has not been established. However, you’re welcome to leave your comments here and I can forward them to the committee when it is up and running. Congratulations! A dozen years after it was suggested, we have a panel of people who can be polled internally by City of San Diego planners, Councilmembers, and staff about “alternative” transportation. In all seriousness, I hope this leads to new and better communication between street users, advocates, and municipal government on many different levels.